The $148.5 million project greatly improved the travel experience by allowing passengers to move more easily between the new International Terminal and the south side of the airport campus, notes Cynthia Guidry, deputy executive director for the Planning and Development Group of Los Angeles World Airports (LAWA). “While Terminals 4, 5, 6, 7 and 8 are connected through a series of tunnels and corridors, the connector to the Tom Bradley International Terminal (TBIT) completes the link that allows travel between all of those terminals and TBIT without having to clear TSA screening a second time,” she explains. Previously, passengers rode shuttles between terminals. Now, they walk or take automated people movers through an atrium with natural lighting. The Los Angeles Daily News estimates that the new terminal connector saves connecting passengers about 45 minutes. The quicker, easier access helps them make use of lounges, concessions and other amenities throughout the airport. Facility Design & Construction: Turner Construction Co. The new four-lane TSA checkpoint on the lower level is designed for passengers arriving on international flights who had contact with their baggage in Customs and need to be rescreened before reentering the secure side of the airport, Guidry explains. Passengers connecting from a domestic flight to an international flight are able to remain on the secure side and no longer need to be rescreened. In addition to improving convenience and access for travelers, the multi-use connector also enhances operating efficiency for resident airlines. LAWA funded its $114 million portion of the project through a combination of passenger facility charges, TSA grants, LAX funds and airport revenue bonds. American Airlines, the dominant carrier in Terminal 4, paid $34.5 million for the design and installation of the checked baggage inspection system that is used by the carrier and its international code-share One World partners that arrive at the International Terminal to connect with domestic flights operated by American. CAGE served as the main consultant for the baggage handling system, and Turner Construction designed and built the overall connector facility. Not surprisingly, the 104,170-square-foot project was a long-term initiative. Some of the buildings were initially conceptualized during the design of TBIT in 2009—specifically, the structures that would connect the new terminal with Terminal 4 to the south Terminal 3 to the north. Airport officials began collaborating with American Airlines in 2010 on a structure to connect TBIT to Terminal 4, and construction began in early 2014. While most of the connector debuted in fall 2016, the walkway on the top level opened to passengers in February 2016 and the remainder of the public space opened a few months later. A facility for passenger buses that will serve the South Terminals was constructed during the connector project, but is not yet in use. LAX will open the bus port as passenger traffic dictates. Removing bulky baggage screening equipment from the lobby of Terminal 4 and relocating it inside the connector created more space for airline operations. The energy-efficient components in the new handling system support LAWA’s sustainability goals. American Airlines began planning for an in-line checked baggage inspection system more than a decade ago, but was challenged by a lack of space, Guidry explains. When the connector project paved the way for a new baggage system, CAGE was selected to design, construct and commission it. The new multi-level handling system includes interline sortation at the ramp level and an inline screening subsystem on the concourse level. The system uses five CTX-9800 machines in the Checked Baggage Inspection System and Checked Baggage Resolution Area, and contains more than 450 conveyors. When designing the system, engineers balanced LAX’s space constraints and energy-conservation goals with its current and future screening demands. The SEW-EURODRIVE motors they specified were key components. 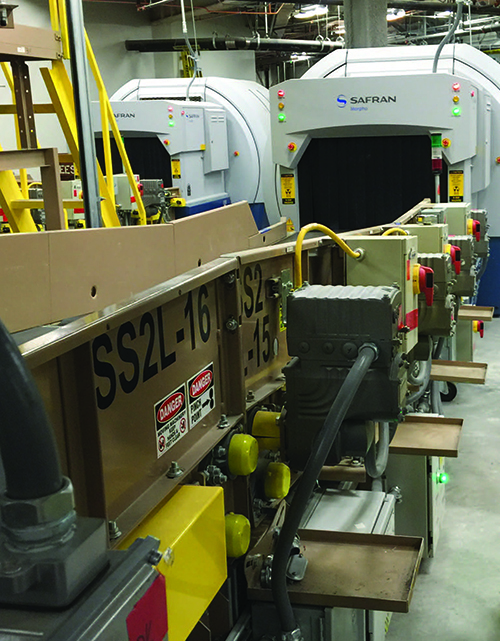 Movigear Mechatronic drives require less incoming power (reducing the full load amps by more than half) and decrease the energy needed for ongoing operation, says Michael Stewart, the firm’s aviation industry manager. “Airports can virtually double the size of the bag system with their existing power station,” he notes. Compared to traditional options, Movigear motors are also more compact, produce less noise and require less space, which makes them easier to maintain, adds Stewart. TSA personnel who work around the baggage handling system all day appreciate that the new drives create less noise and radiate less heat, as well as ergonomic advantages that are especially noticeable in tight spaces such as the checked baggage inspection area. Because the recent project at LAX was SEW-EURODRIVE’s first installation of Movigear motors in the United States, the company built a test system to “debug some of the design concerns.” The trial run also provided valuable training for electrical and mechanical contractors, as well as LAX personnel who now maintain the system. 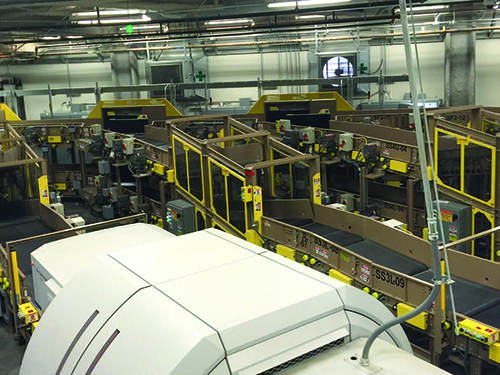 In full operation since mid-2017, the new baggage handling system has been highly reliable, efficient and accurate at screening bags, reports Blunt. It’s a flexible design that can accommodate expansion for future growth, he adds. If passenger traffic in Terminal 4 increases, the new system can handle up to 2,800 bags per hour. The TBIT-Terminal 4 connector is the first non-residential building constructed in the city of Los Angeles certified to L.A. Green Building Code Tier 2 standards. According to project officials, it exceeds stringent California Title 24 energy use requirements by more than 37%. • LED lights in all public areas, with high-tech controls that sense daylight and minimize energy consumed for artificial lighting. When building the new connector facility, contractors recycled fully 84% of the associated construction waste. In addition to surpassing L.A.’s strict green building requirements, the window-lined facility features ample natural light and provides travelers with sweeping views of flight operations on the south side of the airfield, notes Guidry. The airport only had to close parts of TBIT and Terminal 4 when adding the connector. Both remained operational and open to passengers throughout the multi-year process. Finding and relocating underground utilities at the construction site proved to be a challenge. LAX researched various technologies to facilitate the process, and crews ultimately used ground-penetrating radar and electro-magnetic pulse technology, a tool used by the U.S. military. The project also involved the development and use of Building Information Modeling to support planning and proactively identify potential construction issues. The computerized system greatly assisted American and LAX during installation of the checked bag inspection system by clearly showing conflicts between utilities and the new baggage handling system, reports Guidry. Coordinating with all stakeholders—Customs and Border Protection, TSA, airport security and others—before the design process led to successful discussions and problem-solving, she adds. Transparent communication and close coordination, plus experienced onsite staff, were critical throughout the entire project, agrees Blunt. With the TBIT-Terminal 4 connector proving its worth in operational efficiency and passenger convenience, airport officials are planning on joining TBIT with terminals 1, 2 and 3 on the north side of the airport. The new connector and a ground transportation link to the Metro rail system are key components of a $5 billion modernization project slated for completion by 2024.